This week's Chicago Tribune has an illuminating look at Eleanor Kaye Wilson a.k.a. "Mama Kaye" -- a close friend of the Obama family and Sasha and Malia's godmother. Ms. Kaye's bio on the White House press release describes her as an educator whose work has included stints at DePaul University's School for New Learning and at the Chicago City Colleges system, "where she developed ... a welfare-to-work education and training program for General Assistance participants." 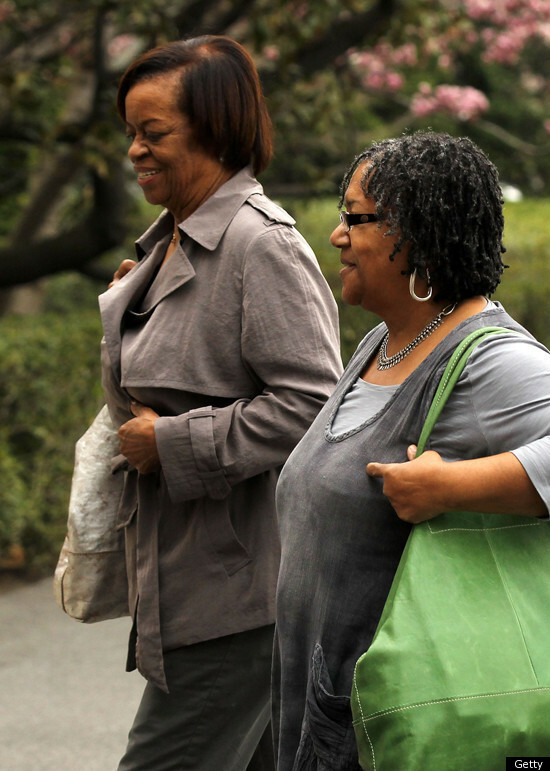 Ms. Wilson, who lives in Olympia Fields, is the Obama girls' godmother as well as a friend and contemporary of Michelle's mother, Marian Robinson. Yvonne Davila, a friend of Michelle's since their days working in City Hall, told me that when Michelle and Barack were on the campaign trail, the Obama girls would often stay with with Mama Kaye, whom she describes as "the Martha Stewart of our group. ... She does foods that are amazing. She also does arts and crafts and it's such a great [treat] for our kids to go over there." More recently, we came across Mama Kaye's name in the White House pool reports during the First Family's trip to Brazil, Chile and El Salvador -- it seems that she served as a traveling companion for Robinson and "greeted foreign officials and enjoyed red-carpet treatment, just footsteps behind the president," the Tribune adds. "After Obama won the presidency, the voluble, gregarious woman told The Washington Post that she didn't want to sleep in the Lincoln Bedroom, lest she'd be the one to spill coffee on the Gettysburg Address." "Last February, Obama singled out 'Mama Kaye' at a prayer breakfast in Washington for setting up prayer circles for him around the country. She started with her own Bible study group, he said, but "once I started running for president and she heard what they were saying about me on cable, she felt the need to pray harder." Mama Kaye's husband, Wellington Wilson, 76, is an ex-Marine and former educator. He's referred to as "Papa Wellington" even by one Barack Obama. The more we find out, the more we embrace this White House's chain of command. If mom says no, ask grandma. If grandma says no, ask grandma's friend. If grandma says no, ask Papa Wellington...how could a man with that name be anything short of awesome? It IS A New Day !